There is something new in Otis's room. At six weeks it was time to introduce the Octahedron mobile. "The octahedrons are designed to lay the foundations for future understandings of geometric proportion, relationships and patterns. 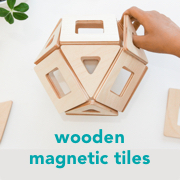 They are named for the ancient Greek philosopher, Plato" At Home with Montessori. I hope that you are interested in mobiles, because I intend on showing you each one that we use. 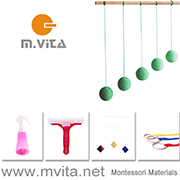 Yes, I may indeed have a liking for these Montessori mobiles! Edited 21 May. A new video (taken on iPhone) showing the Octahedron in action. Thank you for your suggestions to add some black and white images to Otis's room. I thought it was a great idea. We went to work straight away. Caspar and I experimented with lots of different images and materials. Then we tested the images on Otis. He liked them all! We decided on some cut out shapes. We finished off the look with black and white frames. What do you think? He has responded to them really well and we like them a lot. Otis is nearly four weeks old and I feel like I need a refresher... it's too easy to forget or get distracted by the busyness of everyday life. talk to the child about what you are about to do (before you do it) as in "I am going to pick you up"
ask the child questions and give the child choice whenever possible. As Otis is now two weeks old we put up our Munari mobile. The mobile is hung over his movement area. We were thrilled as he focused on it straight away. He has been spending a lot of his awake time in his movement area looking at the wall mirror and having tummy time. Adding the mobile gives him another area of interest. We purchased this mobile from At Home with Montessori and highly recommend them. At Home with Montessori is also a really good source of information on the Munari and whole lot more. I also really, really enjoyed Sara's recent post Cultivating Independence in Children where she gives her son independent time interacting with his mobile. It wasn't until recently that I became aware of Montessori's work regarding infants. Previously I thought Montessori was only about activities for preschoolers and the Montessori Method of education. Certainly this is where a lot of her work is but she also had so much to say about newborn and infant children. In setting up our home environment for our second child I have really tried to follow and understand her work in this area. In his bedroom we have installed a low wall mirror. Underneath the mirror is a soft blanket to create his movement area. This is where he is starting to spend his limited awake/active time. It is also where he has his tummy time. Initially I thought about not installing the mirror. It took us a long time to put it up and it was a bit of a hassle. It would have been easier to forget about it. But now I am so glad that we persisted. When I first put him on the blanket and he saw his reflection he was instantly engaged. encouragement to lift their head especially during tummy time, "controlling the head is the beginning of his mastering of the environment." The movement area gives the child lots of space for moving around, which a child requires from the start "infants can slither from birth". Now that we have experienced time spent using the wall mirror and this movement area I can see how beneficial it is and how easy it would have been to overlook it. Certainly it is something I would recommend to anyone setting up an environment for a newborn or infant. It is worth the hassle. I think as Otis gets older he will spend more time in this movement area. My next step is to put up his mobile and over time introduce some materials for him to use. This week we were blessed by the birth of Otis. He is beautiful and healthy. We couldn't be happier and it feels like we are living a dream. I am constantly trying to bring myself back to reality but it may take some time. The birth went smoothly and although not the family event that I had planned it was really empowering. It feels like Otis has been with us forever, he has settled in at home easily. Caspar has adjusted well and has remained really relaxed and not fussed. I am actually feeling some guilt about how well things have gone. Some more photos and possibly a birth story to come soon.